CSS, by itself, does nothing. CSS formats your webpage. Without it, there is only content, and no structure or styles. Creating external style sheets prevents you from having to write code multiple times, and makes it easy to modify. Using CSS properties, you can modify the appearence of your HTML. This can done by targeting HTML elements. What is the CSS doing here? CSS is constructed of selectors and properties. Selectors determine where the styles are applied. Properties determine what those styles are. CSS begins with a selector, followed by curly braces. Declare your styles inside the curly braces. "apply these styles to all ps that are direct children of a div of class introduction inside the main section"
Imagine every HTML element as a 'box'. 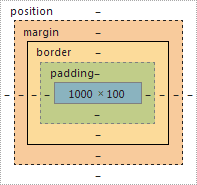 Every box consists of four different 'layers': Margin, Border, Padding, and Content. Margins and padding help to position and align content inside an HTML element. Padding and margins are transparent. Think of it as empty space. fonts: which fonts are always available? what are web fonts?